You might want to double check some wing anatomy. I'm pretty certain that isn't how feathers are arranged on wings. I think I prefer this one to the other version. The claws on the boots always struck me as odd. Bladewind wrote: I think I prefer this one to the other version. The claws on the boots always struck me as odd. Thanks Bladewind... the wings are actually artificial and part of a harness that is part of her costume. I used a lot of reference pics of Eagle Wings trying to get the wings on the harness right... and they are a modern update of the wing harness created by the first Freedom Eagle (her grandfather). I was going for more natural colors of the artificial feathers to look like the American Bald Eagle (and thus part of why the helmet is white). 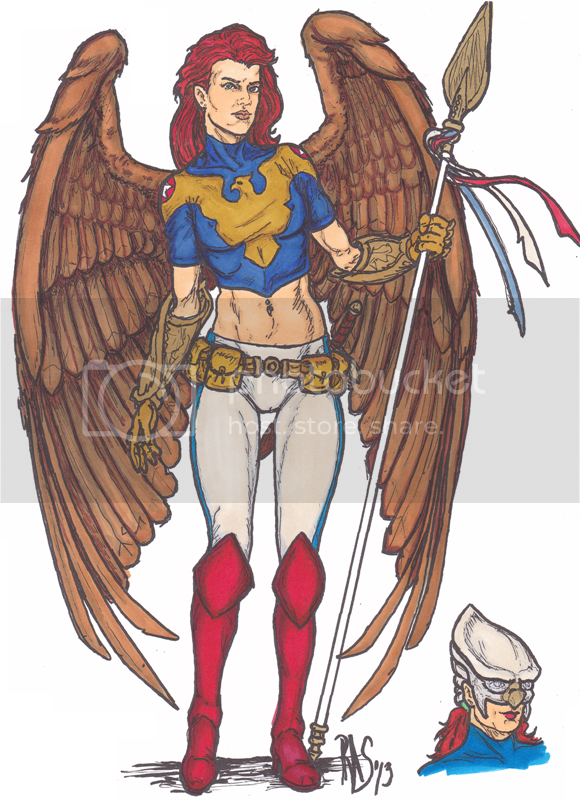 I'm gonna be re-doing the colors.... with a dark blue top and dark red boots. But I can't decide if i should add any eagle-like accents to the power gauntlets (like more pronounced talons that are retractable). I'm starting to think that the energy Halberd should be more of a focus for the energy that the gauntlets are able to fire off... and thus cause people to think that it's the real weapon and not the gauntlets. But i'm not sure... and still trying to figure it out. 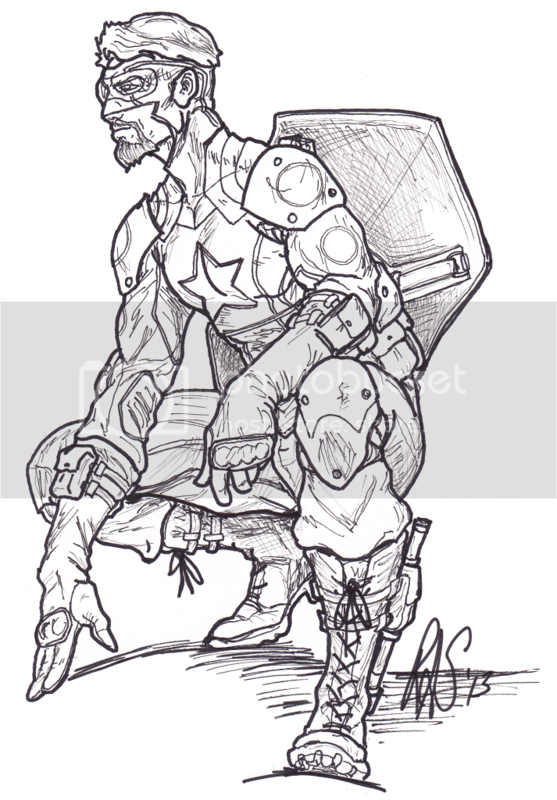 Minuteman III: The latest incarnation of the Minuteman... this pose in this picture is based on a Hero Machine 3 picture of a modern version of the "Fighting Yank" that i found on Deviant Art, and I really liked the pose. 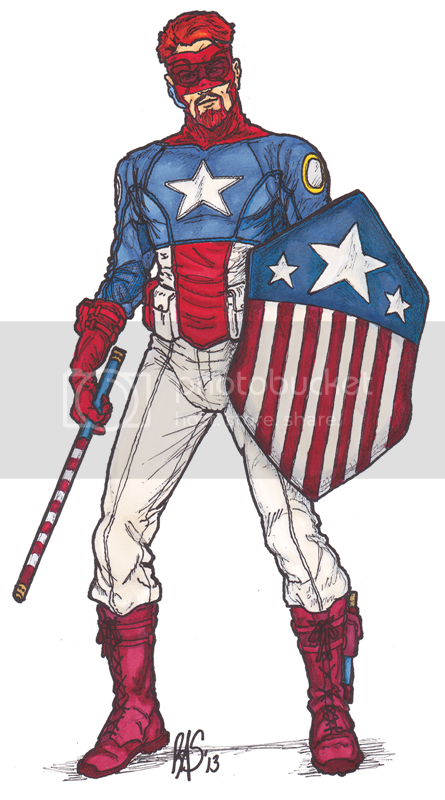 So I used it in my design for the new Minuteman! I've yet to decide if he's the latest in the Hawthorne family line to carry the legacy, or a totally new character taking up the legacy in my Mutants & Masterminds RPG 2e campaign setting. Chimera: Chimera is one of the characters from my home M&M RPG 2e F2F game, she's a shapeshifter who can turn into any animal that she's touched... something made easier thanks to her job as a Zookeeper & Veterinarian's Assistant! 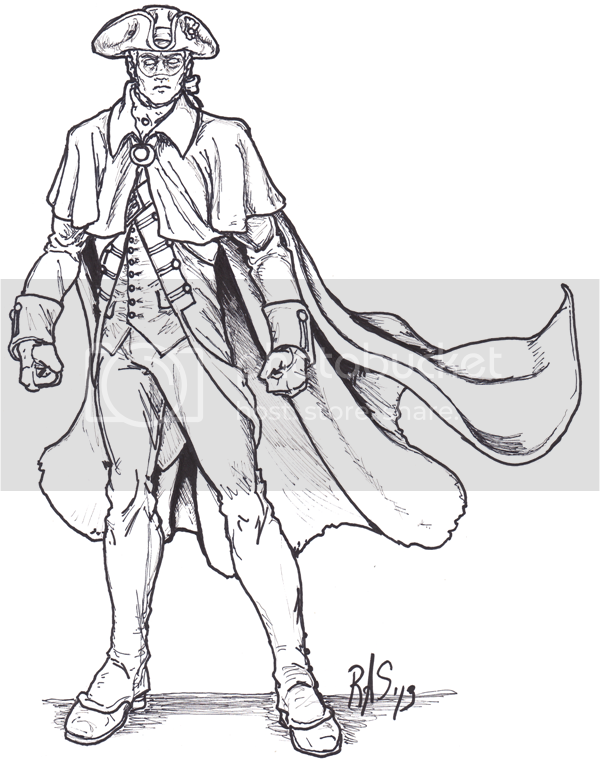 Bizarre: Bizarre is another of the characters from my home M&M RPG 2e F2F game, he's a Vampire/Atlantean hybrid-like creature (it's a very complicated background that came from the player's earliest superhero character). 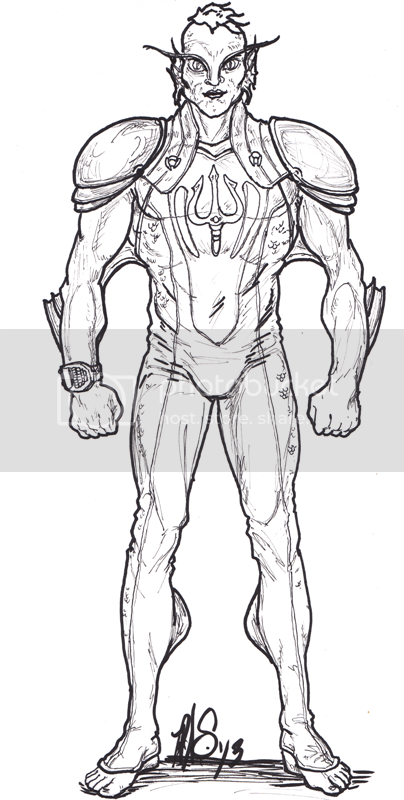 This is almost finished as what the player wanted (went through about six different sketches to get to here)... though there are a few of the sketches I plan on finishing for a picture of an NPC for the Freedomverse w/Marvel Universe & DCU elements campaign setting that I've been working on. danke! i've been playing around with the colors of Minuteman III and will be posting them a little later tonight! I like the additions of the reds. Very patriotic. kenseido wrote: I like the additions of the reds. Very patriotic. I've studied the various pictures of Revolutionary War uniforms of the Continental Army, and the red facing & cuffs was the official uniform for the infantry. The light tan (or buff) facing and cuffs along with the waistcoat and trousers were reserved for generals and their staffs. 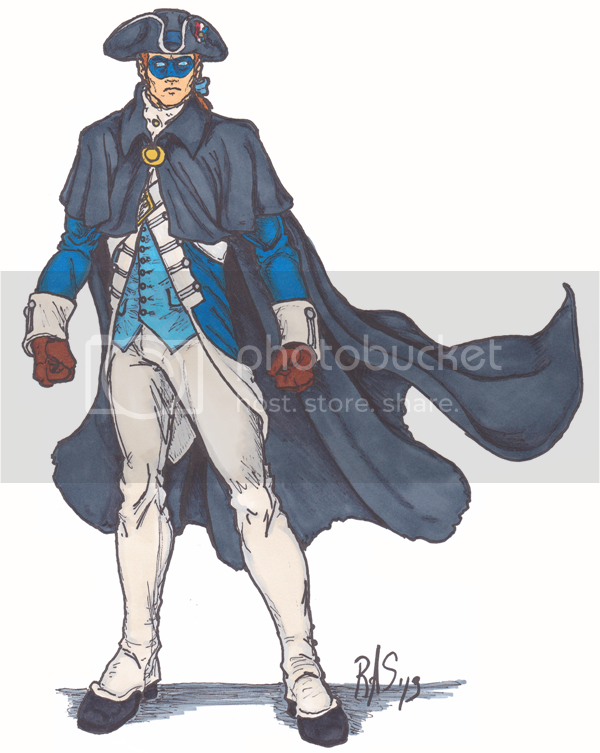 it's amazing to find out that the early military combat uniforms were also their dress uniforms. as hard as it is today to believe that wearing such bright colors into combat shows how different the methods of war has become in the past century and half. gone are the days of maneuvering troops as a block so they can fire in barrages, and the bright colors allowed generals to know what unit was which so they could issue orders via flag signals and the like. 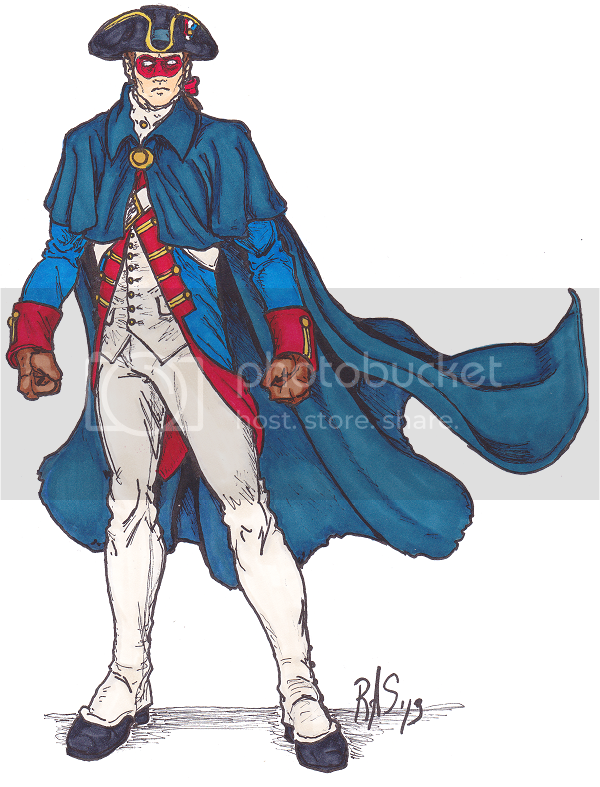 I've still not decided if the modern Minuteman is going to be a member of the Hawthorne family, or someone who has adopted the identity... though going with the rediscovered legacy would have some really good gaming opportunities for whom ever plays them! Agent Sebastian Mycroft (Supervisory Special Agent Sebastian Mycroft), SHIELD Agent (PL6/108pp. ): Mycroft used his GI Bill to get a Master's in Criminal Sciences degree and a Bachelors in Applied Sciences degree so that he could get a job with the Federal Bureau of Investigations after spending ten years in the US Army Rangers, working his way up the ranks to the rank of Staff Sargent. Real Name: Sebastian Mycroft MCJ BSc. ; Identity: Known to Authorities; Other Aliases: "<>" (), "Special Agent Mycroft" (FBI Special Agent), "SSG Mycroft " (US Army Ranger); Base of Operations: Freedom City, DE, USA; Place of Birth: Philadelphia, PA, USA; Legal Status: Citizen of the United States of America w/no criminal record; Marital Status: Married; Occupation: SHIELD Supervisory Special Agent, former FBI Agent, former US Army Ranger Non-Commissioned Officer; Religion: Roman Catholic (practicing); Allegiances: United States of America, SHIELD aka "Strategic Homeland Intervention & Enforcement Logistics Department", The Mycroft Family; Meta-Human Capabilities: None; Ethnicity: Caucasian; Gender: Male; Orientation: Heterosexual; Age: 00 (22 May 1969); HT: 5' 11"; WT: 195lbs. ; Hair: Black; Eyes: Dark Blue; Physical Appearance: Agent <> '<>' Mycroft is an average looking middle-aged adult Caucasian male in excellent physical condition for a man his age, height and build who engages in moderate regular exercise on a daily basis to stay fit and healthy; Distinguishing Physical Characteristics: Agent Mycroft most distinguishing characteristics are his receding hairline and US Army Ranger tattoo on his right upper bicep. Personality & Motivation: Agent Mycroft is a consummate professional government operative whom takes his work very seriously, but maintains a sarcastic wit in an attempt to cover for his own amazement at the various meta-humans his job has brought him into contact with. 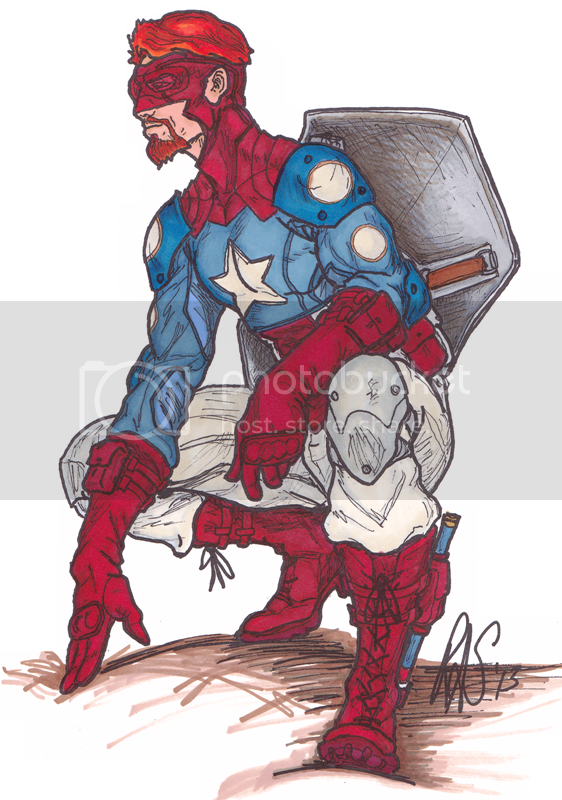 He also uses his sarcastic wit as a means of keeping the costumed adventurers egos in check. Powers & Tactics: Agent Mycroft is a coolheaded operator whom believes in being prepared for a wide variety of contingencies for any possible encounter while out in the field. 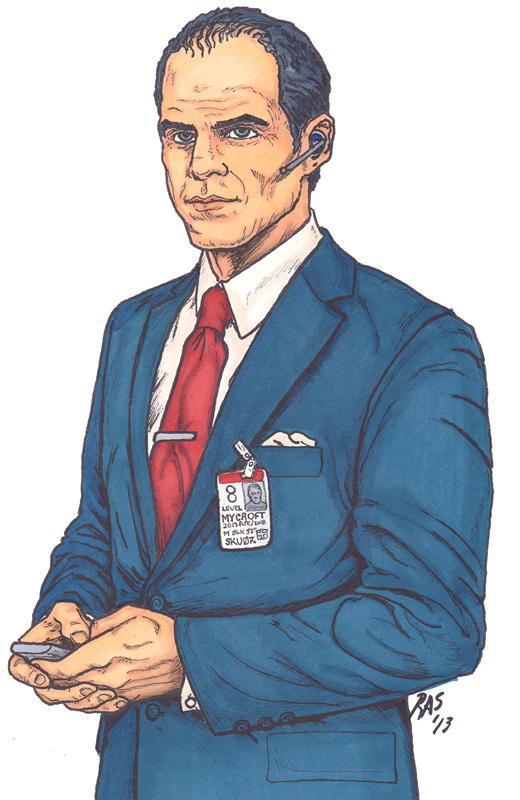 Normal Attire: Agent Mycroft wears a dark blue-grey business suit, a dark red tie, a white dress shirt, a white second-chance ballistic vest, a white undershirt, a black leather belt, a pair of black socks, a pair of black leather dress shoes. Attributes: STR +2 (14), DEX +2 (14), CON +2 (14), INT +2 (14), WIS +3 (16), CHA +2 (14). Saves: +5 Tough (+2 w/o Vest), +8 Fort, +8 Ref, +8 Will. Notice 5 (+8), Profession (SHIELD Agent) 3 (+6), Search 6 (+8), Sense Motive 7 (+10), Sleight of Hand 2 (+4), Stealth 2 (+4), Survival 1 (+4), Swim 2 (+4). Feats: All-Out Attack, Assessment, Benefit: SHIELD 2 (Supervisory Special Agent), Chokehold, Dodge Focus 2, Equipment 4, Fearless, Fighting Style: Krav Maga, Improved Block, Improved Disarm, Improved Grapple, Improved Trip, Jack-of-All-Trades, Martial Artist, Martial Strike 2, Power Attack, Take-it-in-at-a-Glance, Takedown Attack, Well-Informed. Equipment: Cell Phone, Commlink, Laptop Computer, Flashlight, Handcuffs, Undercover Vest, Glock Pistol. Combat: +2 Initiative, +6 BAB (+6 Ranged, +6 Melee, +8 Grapple), +6 Glock Pistol, +6 (DC18), +6 Unarmed Attack (DC19), +6 Defense (+2 Flat-footed), -2 Knockback. 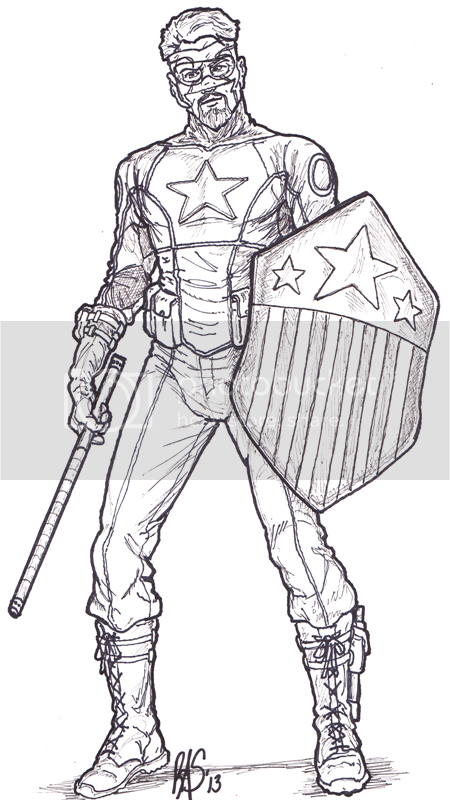 Drawbacks: Responsibility: SHIELD (common/major: -4). Languages: English (native), Arabic (fluent), Mandarin Chinese (fluent). Abilities 26 + Skills 25 (100 ranks) + Feats 24 + Powers 0 + Combat 20 + Saves 17 - Drawbacks 4 = 108pp.